On our first date night with the help of my Twitter friends, I decided to make Salsa Chicken for dinner. 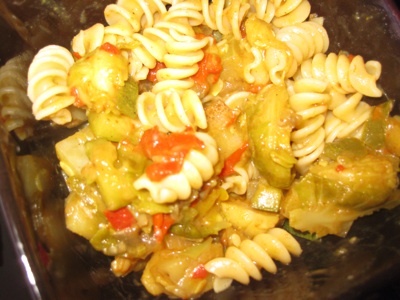 This is one of those super easy dinners that just taste good and have endless possibilities. 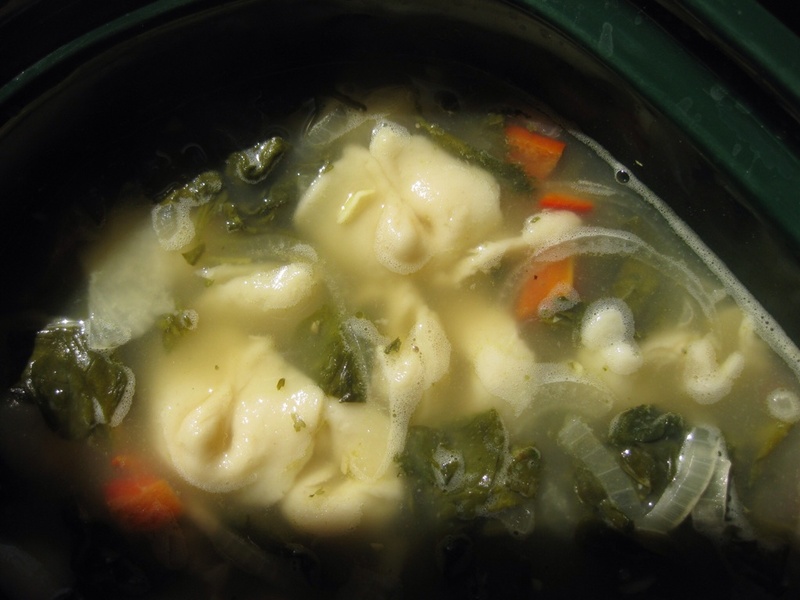 Besides a Crockpot, you will need these . . .
Of course, these ingredients are interchangeable. No corn, different beans, add peppers and onions . . . Ect. Put your chicken breast at the bottom of your crockpot (i had 4 small thin chicken breasts on hand that were thawed) and pour salsa over them. Your going to want enough to cover the chicken. They don’t have to drown in salsa, so a jar should do it. Next, pour your beans and corn on top or whatever components you chose. Yeah ummm . . . That’s it! I told you it was easy, now go make it and tell me how it was! What is your easiest dinner recipe? I know this dressing may not be news to most, but I’m going to post it anyway since I use it a lot. This dressing combines the most simple ingredients to make a salad taste light, fresh and comes without any of the nasty chemicals that normal dressings do. Juice your lemons. I used 3 because these were small, but 2 big ones do the trick too. After discarding the potential lemon offspring (seeds 🙄 ), put the spices in. I have no exact measurements as everyones tastes are different, so just taste as you go along. Just watch the salt as the acidity of the lemon already has somewhat of a salty taste. Start whisking in your olive oil. You want 2 times more olive than lemon juice. You may want more or less depending on what you like, but this combo works good. Throw it in the fridge and when you are ready to use, shake it up a bit before putting some on your salad. This usually lasts at least a week when covered in the fridge though I have been known to keep it in there without any problems for longer. 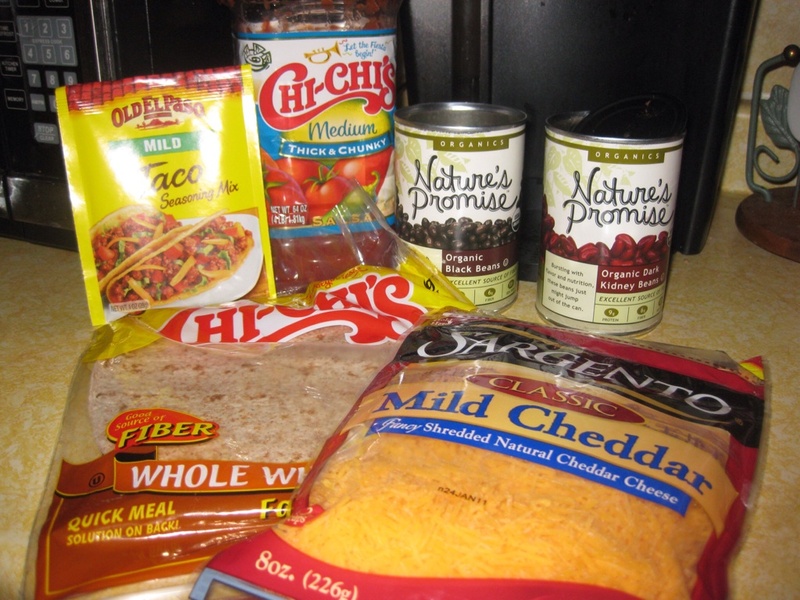 You can also use different flavor combinations by adding things like chili powder, onion powder or my personal favorite . . . Dijon mustard. What do YOU put on your salad? Honestly, I feel bad even calling this a recipe since it literally is just things being thrown together with a pre-made sauce, but it was so good I just have to share it. Lately, I have been getting into Indian and Thai food. I decided to buy a curry sauce at the store to see if I could come up with something at home rather then spend the money to go out. I ended up finding a Thai yellow curry sauce at Stop & Shop and went to town. Here’s what I had to work with . . . I literally threw together whatever I had. Originally I just planned to use the pepper, onion and eggplant I just bought, but I decided to look in the freezer to see if I can bulk up the life force a bit. 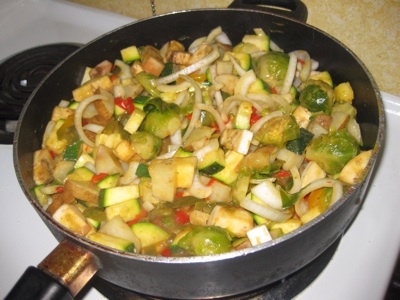 I ended up finding multi colored pepper strips and brussels sprouts that I knew had a small chance of ever being used. I also dug out 2 potatoes from the fridge for some density. A side note though, before I put them in the pan with everything else, I poked some holes in them with a fork and microwaved them for a few minutes just to soften them up enough so they wouldn’t end up being undercooked and it worked like a charm. After it all went in the pan, I kept it at medium heat until everything started marrying together. I threw a little sea salt in there so the veggies could sweat out one last time. I added the curry sauce and then just let it simmer with a lid on until all the veggies were cooked through and a mushy parade of semi-spicy goodness unveiled. I served it over some pasta although rice might have fit the bill better. Honestly, it would have been good just by itself! I know it doesn’t look amazing, but I promise it is. 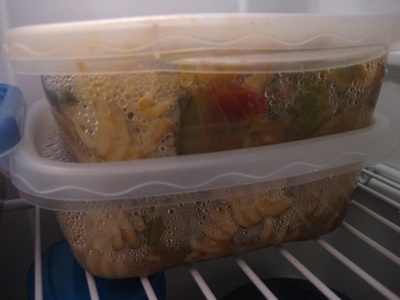 As always I made sure I put some in plastic containers for pre-made meals AND I ended up freezing a good amount of it for a rainy day. Whats your go to ‘throw everything in the pot’ sauce? We contemplated going to dinner for a while but we decided it’s a much smarter decision for me to make something after finally going food shopping. We spent more then we would have liked and I’m kind of upset I didn’t stick to my list and research more, but live and learn. For dinner I was craving a hearty Mexican type meal. I know what I ended up with is similar to an enchilada, but I’m not calling it that because Im not sure what exactly is in enchiladas. 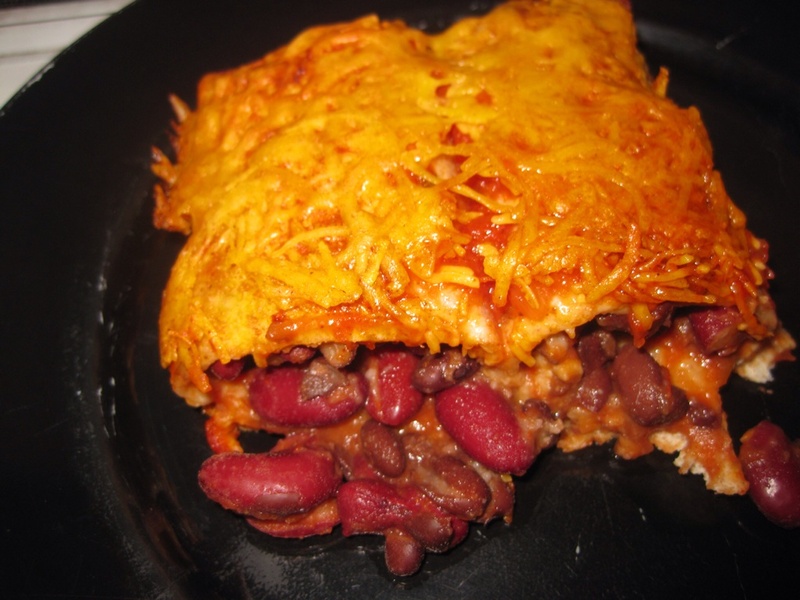 My goal was to roll up beans in tortillas with Mexican flavors and bake with cheese on top. That’s pretty much exactly what I did. Here’s what I had to work with. 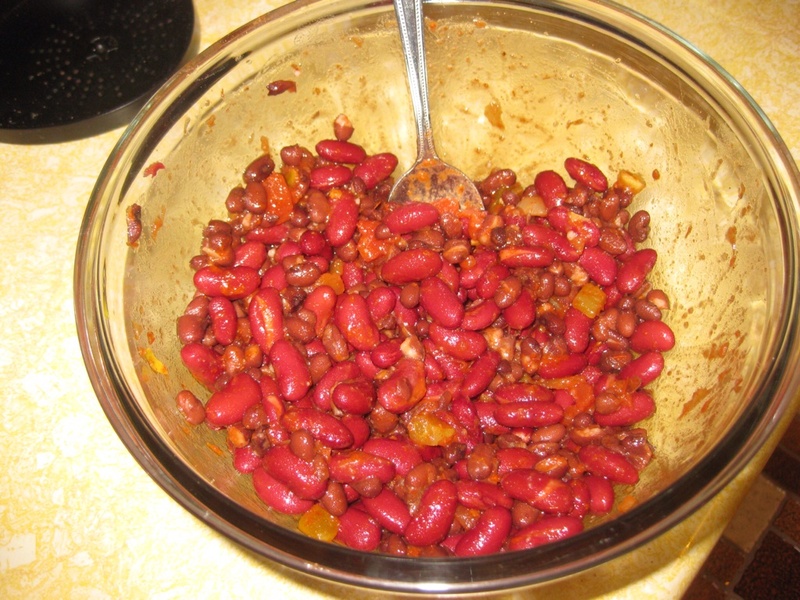 I mixed up the beans with some salsa and some taco seasoning. 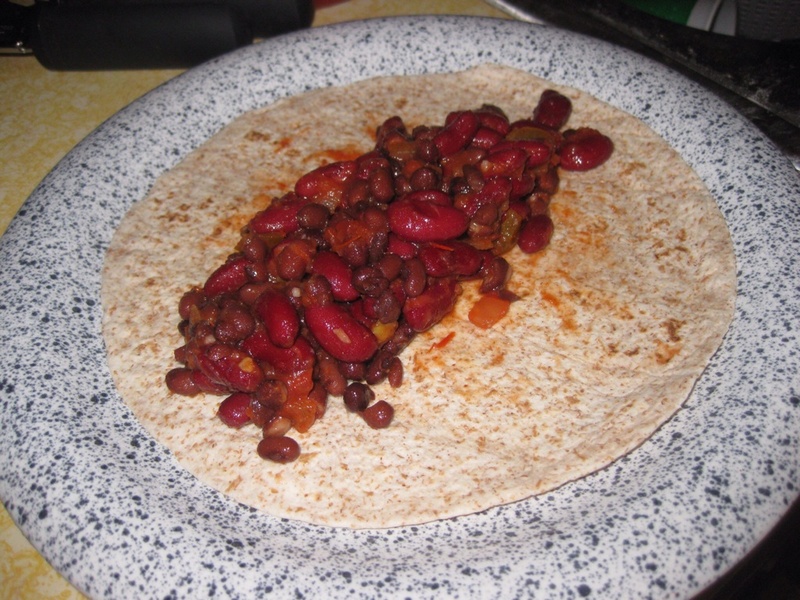 Then put a heap of the mixture in a wrap, and rolled it up. 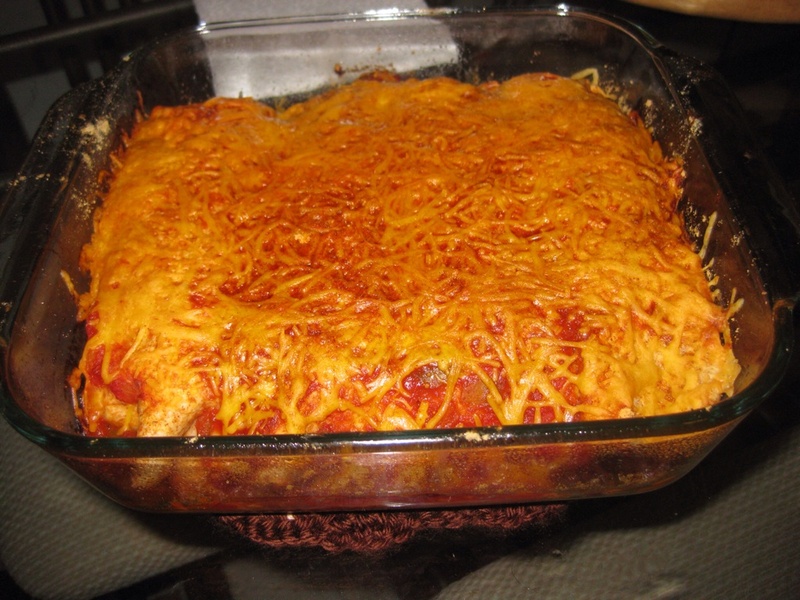 I squeezed 4 roll-ups into a baking dish and topped with more salsa, cheddar cheese and more taco seasoning. Baked for 25min @ 350. In a few short months it will almost be a whole year since Chris and I have lived together. We still have a lot of adjusting to do in this apartment but we have been getting things down pretty good. One thing I haven’t quite got down so well is our grocery budget. We each put the same amount of money away each month and go food shopping with it about every 2 weeks. The past few months I shaved about $40 off the budget and that used to be ok, but as we are eating more meals in . . . We find ourselves running out of food quick! From now on, I’ll be adding that extra $40 back in but until then, we gotta figure out what to eat with what we have already in the house. I love these challenges because I hate waste and I love being creative. 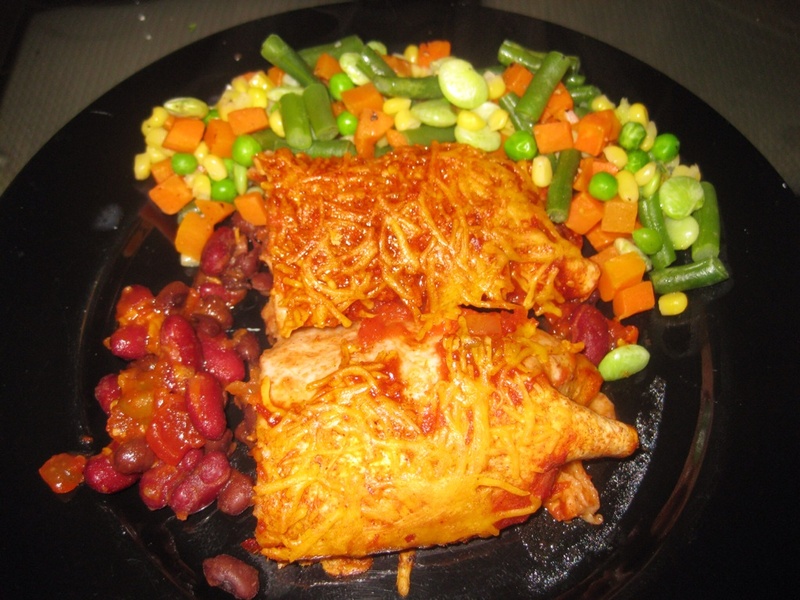 This is what I came up with for tonights dinner which will probably last for a lunch or two or maybe another dinner. I wouldn’t even call it a recipe since I literally threw all the ingredients in my crockpot . . . Set it and forget it! Here’s what I had to work with . . . . 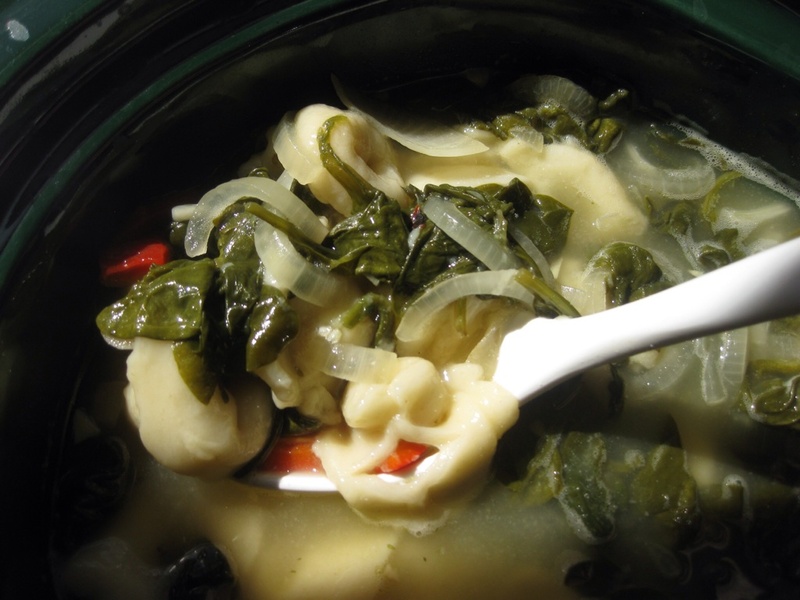 I cooked some raw baby spinach that was almost on it’s last day the night before. 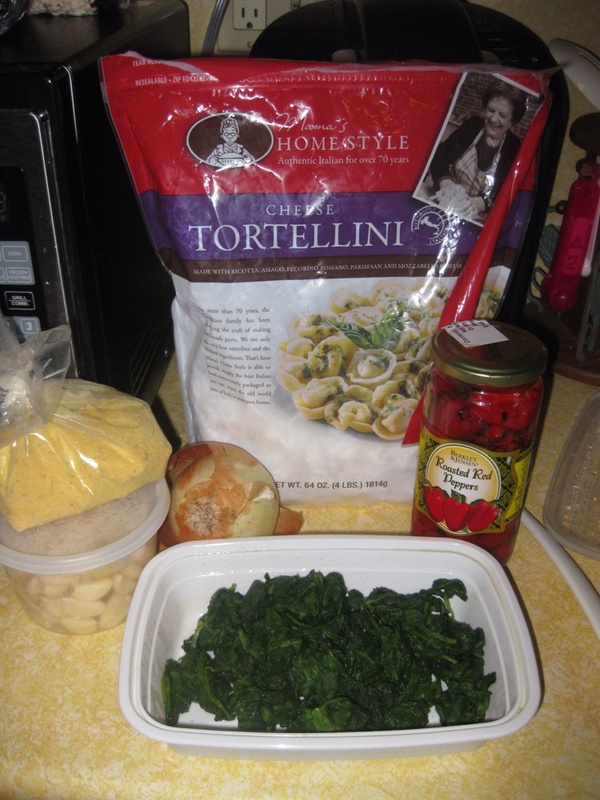 I had a bag of tortellini, some chicken stock powder, roasted red peppers and garlic and onion. 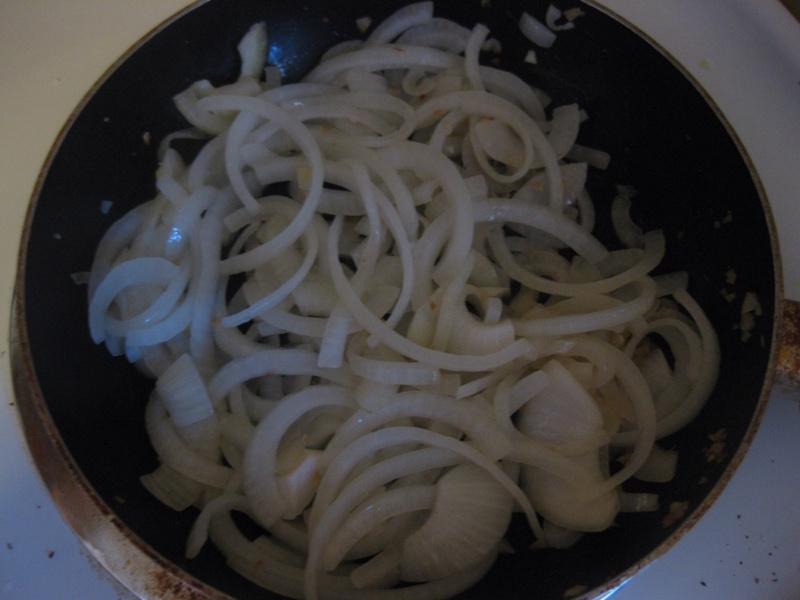 I cooked the onion and garlic a bit to draw out the raw flavor. I filled the crockpot with about 10 cups of water and mixed in the chicken stock powder. Then . . . I threw everyone else in for a swim on HIGH for about 6 hours. 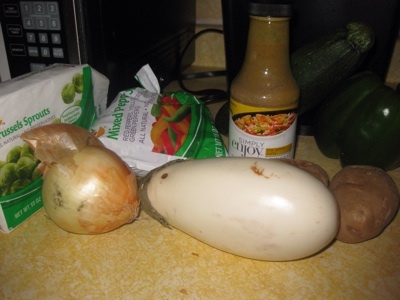 Were you ever short on money and created a meal from the few things left you had? What was it?